Weber 741001 Silver One-Touch provides 363 square inches of total cooking space, which is large enough to cook for 2-3 people. The plated steel cooking grate is 22-1/2 inches in diameter and features rust resistant vents. It comes with porcelain enameled bowl, to prevent rusting, and lid with glass enforced nylon handles. The aluminized steel One-Touch cleaning system is for users to clean out the ash hassle free. The dimensions of the grill are 25”wx 38.5”h x 22.5”d and it comes with 10-year limited warranty. For convenience, the assembly of the grill has been made very easy. It can be put up together within thirty minutes with help of the clearly illustrated assembly manual. The bottom has been designed in a way that while working, you can easily move around the coals for indirect grilling and smoking with wood chips. The design is very effective at focusing the heat on the grating for better cooking of the food. The adjustable vents help in controlling the airflow to the coals, so you can keep the right temperature you want, to cook food. The elevated grill means users don’t have to worry about burning out the surfaces they are working on. The handle might get very hot to pick up the without use of a glove or a cloth, resulting in chances of burning. Ash that drops on the ash catcher might fly away during strong breezes, resulting in a mess which will take time to clean up. Some might even find the ash catcher to be not of appropriate size to handle ash. Though the attached wheels provide users with portability, they might get damaged while moving. 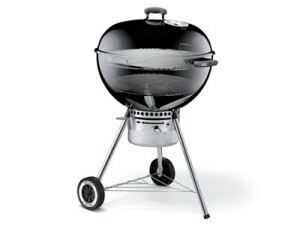 The grill might require constant vigilance to prevent fire from shooting up or getting too hot. The easy assemble means you can set up Weber 741001 Silver One-Touch 22-12-Inch Kettle Grill, wherever and whenever you want. Use the grill with care and supervision, and it will provide you quality foods which not only taste but look delicious. The users are sure to benefit from this grill when cooking foods to perfection.